So we debuted at Flatstock this year! The Zookeeper took a portfolio of prints and glugged a load of T400 (an energy drink since dubbed Dirty Magic), he sold stuff for Euros and then drank and danced and made friends with all the other Flatstockers. It was a good time. …if you haven’t checked out the fuzzy, garage pop/surf vibe of Best Coast you ought to, they’re great and remind us of a few tracks from The Throwing Muses “Real Ramona” LP. As you can see, he also managed to snake (no, not sneak – snake!) 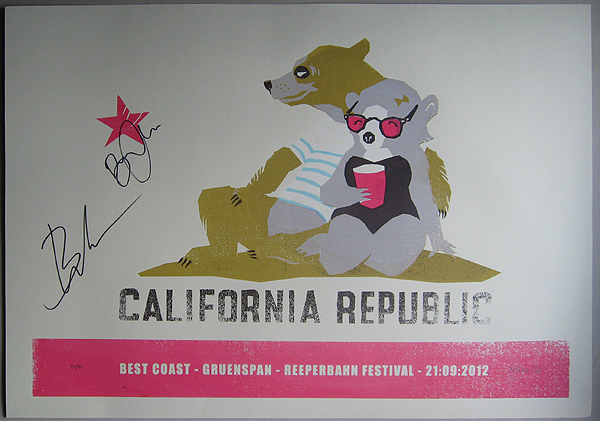 backstage and get 3 of these autographed by Bethany and Bobb… pretty cool. I’m sure most of you will know that the design is a play on the Californian State flag which features a brown bear ambling toward a red star. We hope this little twist is testament to that sweet lo-fi fuzziness that the band are known for… if you want to pick one of these up get in touch (pzprints@gmail.com) – thanks! More Germany news to follow… soon. This entry was posted in Exhibitions, Festivals, Gigposters, Peacock, Screenprints and tagged affordable art, animal print, bear, bear print, best coast, california, californian republic, festival, flatstock, garage pop, gig, gigposters, gruenspan, hamburg, indie, petting zoo, poster, reeperbahn festival, surf. Bookmark the permalink.